One of the most important points to understand upfront is that nothing is changing straight away. The various Skype for Business clients will remain supported indefinitely across both on-premise server and online services such as Office 365. There will still be a new version of the Skype for Business Server which Microsoft are targeting for the second half of calendar year 2018. This allows customers to make the transition to the cloud when they are ready. For customers in the process or at the early stages of deploying Skype for Business however, Microsoft recommends evaluating the Teams roadmap to assess current features and timescales. Accordingly, customers should plan to deploy Microsoft Teams instead unless there are specific reasons not to. Microsoft recommend all Office 365 customers start using Teams either alongside Skype for Business or separately. Ultimately Microsoft has said Teams will evolve as the primary client for intelligent communications in Office 365, replacing the current Skype for Business client over time. Microsoft are giving customers tools, guidance and recommendations now, so they best manage this transition. Teams has been a huge success so it’s with little surprise that Microsoft want to consolidate two tools that do a similar job. In less than six months since it’s official introduction in March 2017, 125,000 organizations are using Microsoft Teams as a hub for teamwork in Office 365. Microsoft vision is of intelligent communications, things that might not have been possible even a few years ago. A more agile, redesigned Skype back-end infrastructure that is powering Microsoft Teams for enterprise grade voice, video and meetings. Taking the capabilities of Skype for Business with Office 365 and combining those with the capabilities of Microsoft Teams for a single client experience. This means over time the Skype for Business client in Office 365 over time will be retired. This is Microsoft vision for intelligent communications with the architecture, with a single client experience and an exciting roadmap. As an example of intelligent communications, Microsoft have talked about knowing everything about who is attending a meeting and what is being discussed, with all the context and all the background information. Then during the meeting there is no barriers, language, visual, audio, even just a noisy meeting room gets eliminated. Then after a meeting, technology does all the heavy lifting, like sending out a summary with action items. All of this is becoming possible with intelligent communications. Microsoft Teams will receive more Skype for Business type features as the two clients converge. Microsoft are aiming that during H2 CY18 the currently available Cloud PBX and voice capabilities will be added to Microsoft Teams. As well this, upcoming features that had been part of the Skype for Business in Office 365 roadmap will be added to Microsoft Teams. There will be an updated roadmap for Teams to be available in October. Here are the Microsoft Teams specific items on the Office 365 Roadmap. A contacts tab is being added to Teams, where Skype for Business contacts and groups will automatically be imported. Presence information (available, do not disturb etc.) has been combined with a unified model across platforms. A full dialling number pad to make calls, with full PSTN capabilities, dial out to any number whether it’s international, national or an extension within the organization. Like Skype for Business, in Outlook there is an option to schedule a Teams meeting in a calendar. This makes it easier for users to start using Teams with little to no training. The meeting organizer creates the Teams meeting invite, in much the same way as before and send it to attendees as usual, with the details appearing in everyone’s calendar. This is in addition to the different ways that a meeting can be created on-demand within Teams itself, like for team huddles. Meetings can be recorded, so absent team members, for example on annual leave or double booked can catch up later and experience it as if they had been in the meeting, along with all the content. Closed captions in the meeting playback can automatically be shown, with a full transcription being available. This also makes it very easy to search for keywords and then jump to that part of the meeting. All of these features are either in the product or in preview soon. 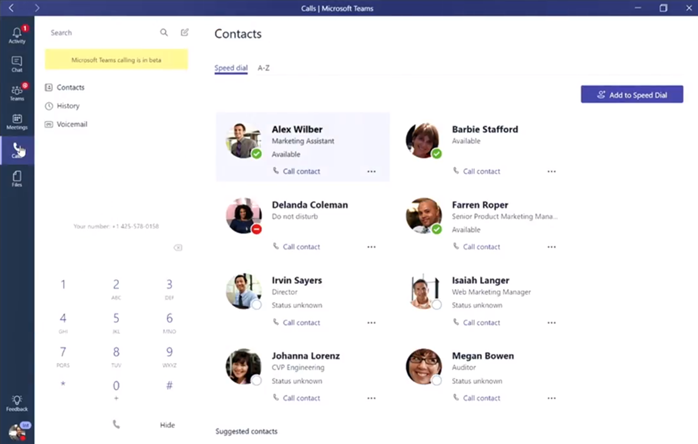 Audio Conferencing is being added to Microsoft Teams, these capabilities were previously known as PSTN Conferencing. Audio Conferencing is now available in Microsoft Teams in public preview. For Audio Conferencing enabled users, Microsoft Teams meetings will have dial in instructions automatically added to their scheduled Teams meeting. This provides phone numbers (toll/toll-free) that can be called as well as local numbers across 90 different countries and 400 different cities. So even for attendees, with no internet connection they can still join and participate in a meeting via an audio call. While Audio Conferencing can be bought as a standalone subscription, it’s also automatically included to those users with an Office 365 E5 licence. As well as this, Office 365 E1 or E3 users can be enabled with an add-on called the ‘Audio Conferencing Pay-Per-Minute’ offering. This is also available October 1st 2017. Customers with this add-on enabled can use Audio Conferencing in their scheduled meetings and Microsoft say they will be billed on a per-minute basis for each inbound or outbound call placed by each attendee during a scheduled meeting. This allows customers to mix and match as many users in the tenant with built-in audio conferencing capabilities on Microsoft Teams and Skype for Business meetings, with having the full E5 or Audio Conferencing standalone subscription. As part of these changes, PSTN Consumption Billing has been renamed to Communications Credits. Communications Credits should must be enabled for the Pay-per-minute option to work.